EDB to Adobe PDF Converter tool is algorithm for storing and sharing all your Exchange Mails by using this efficient EDB to PDF conversion tool. The application supports all Adobe version to perform the data conversion. Convert, store & share Exchange EDB into PDF file. Multiple naming option for output Adobe PDF files. Advanced searching options to find in EDB file. Provision to move EDB files altogether in bulk. Convert selective EDB folders/mails to .pdf format. EDB to PDF Converter allows the conversion and save Multiple Exchange Mailboxes to Adobe PDF format. Single .pdf file is made for each email of EDB file. Once converted, users can share the PDF file over the web without any issues. More than 7 different previews offer a better view of Exchange EDB mails and helps in advance analysis of mails. The different previews options inbuilt in the solution are Normal, Hex, RTF, Attachments, Message Header View, etc. In case users are not aware of file location of Exchange EDB in the machine, the auto-detection feature in the application can be utilized to rectify its location. The product will enlist all the EDB files present and you can choose the file. If you want to convert only a selective number of mails in only a specific folder of EDB file, you can do so by selecting and exporting only the desired mails. Only the desired mails will be converted to Adobe PDF. 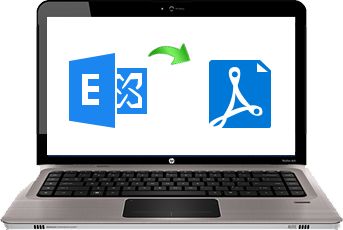 The EDB to PDF Converter handled the migration of all Multiple Exchange Mailboxes to Adobe PDF in a few moments and allows me to share it over the web with my associate. It is really an effective tool. All the features, which are important in a perfect conversion tool, have been made available in EDB to PDF Converter. I am really satisfied and glad that I opted for this tool. There are numerous of reasons because of which users need to move all their data files from Exchange EDB to PDF file format. To perform the efficient data Export Multiple Exchange Mailboxes to Adobe PDF software is made to make the migration process easy. Most of the times, users need to print their Exchange data files. Therefore, to print the data users need to move their Exchange EDB data files to Adobe PDF file format. Moreover, the security concern is another reason of data conversion for users. To move the data in efficient manner users can utilize EDB files to PDF Converter. Retains the integrity of data. No file size limitation to export data.